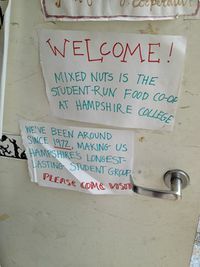 Mixed Nuts is the longest running student group on the Hampshire campus. Since 1972, the co-op has provided cheap, organic, and natural food to the Hampshire community. 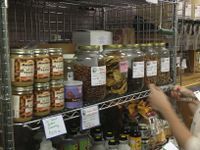 Mixed Nuts is a storefront and buyers’ club enabling members of the community to buy food in bulk. Run entirely by student volunteers without administrative funding, Mixed Nuts is a testament to student dedication. The store offers students the ability to sell homemade items on consignment. They sell so much ginger brew that in theory no Hampshire student should ever have a tummy ache. Then again, they sell lots of chocolate, too. Add us on Facebook for more information! 4 What’s in Store at Mixed Nuts! We have re-opened in our new space in the Roos-Rohde House!! Contact mixednutscoop@gmail.com if you have any questions! The Roos-Rohde House is often filled with a friendly and mostly quite atmosphere that is perfect for studying. There are also lots of great events including live music, art openings, and hopefully DivIII receptions too. If you are interested in having an event at the RRH, contact the Roos-Rohde HouseKeepers at rrhevents@gmail.com. Please leave at least 2 weeks between your request and your event. stay posted for spring 2016 semester hours! Mixed Nuts Cooperative is a student run, volunteer-based collective that aims to promote equality, respect, honesty, and responsibility within the context of food systems and amongst cooperatives. We make all of our decisions based on consensus in order to be efficient, inclusive, and successful. We provide healthy, socially conscious, affo rdable, tasty food to the Hampshire College community. We intentionally source our products from vendors we ideologically support, such as local businesses, other cooperatives, and fair trade organizations. We dedicate ourselves to serving the greater Hampshire community, including students, faculty, staff, families, neighbors, alumni, and the occasional groundhog. Mixed Nuts Co-op also seeks to build relationships with outside cooperatives and other organizations. We strive to educate the larger Hampshire community and ourselves about food sources, who we are as a cooperative, and what it takes to run a small business. What’s in Store at Mixed Nuts! Blue Corn Tortilla Chips, red hot blues corn tortilla chips, Sesame Sticks (garlic, cheddar), Yogurt Covered Pretzels, Chocolate Covered Pretzels, Yogurt Covered Raisins, dollar bags of many of our bulk snack items! None right now, check out the Farm cooler in the Bridge! hummus, Hampshire Farm Maple Syrup! 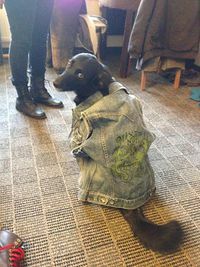 Interested in selling hand crafted items or original music on consignment? Contact mixednutsconsignment@gmail.com . Save money! Support student businesses! Food co-ops! Organic food! Cheap food! Enjoy Mixed Nuts! This list had yet to be updated for 2015, changes coming soon! Cabot Cheddar Cheese 8oz $4.79 ??? Yogurt Covered Pretzels 3.5oz $2.69 ??? Chocolate Covered Pretzels 3oz $2.69 ??? Sesame Stix 4oz $2.69 ??? Chocolate Raisins 4oz $2.69 ??? Banana Chips 5.5oz $2.99 ???? Sesame Cracker Mix 7oz $2.99 ???? Peanut Butter 16oz $9.59 ??? Dr. Bronner’s Bars $4.49 ??? Mixed Nuts is a fully functioning cooperative and membership is an excellent way to gain knowledge and experience with one model of cooperative management and particularly with consensus decision making and management practices. Mixed Nuts is a community of people who are devoted to working together to sustain a functioning business and therefor requires a great deal of commitment, dedication, and accountability as described in the below sections. We also have a ton of fun! Being a member of Mixed Nuts is a great way to meet people who are dedicated and excited about cooperatives, food, and community. Each semester following Hampfest there are four training sessions for new members at different times throughout the subsequent week. Everyone hoping to become a part of Mixed Nuts should find time to be trained, which will allow for their continued membership throughout the semester. These four sessions will be the only training times for that semester, and are required for any new member. In addition to these four training sessions, towards the beginning of each semester the entire Mixed Nuts community will have a workshop and co-op retreat. This will promote community interaction while clarifying all of the regulations and basic structure of the co-op. This retreat is also a vital part of membership and all efforts are made from all sides to enable all co-op members to attend. In order to become a part of the Mixed Nuts community, each individual must be able to dedicate a full semester to the co-op. While a full year of involvement is encouraged, the group understands that with every semester comes new responsibilities. We do hope, however, that many of our participants will integrate themselves with our community and continue to be active Mixed Nuts members. During one’s involvement at Mixed Nuts, each member is expected to work weekly shifts in the store and to attend our weekly meetings. The weekly meeting is extremely important because it is the primary way through which all members stay informed and active in the co-op. This is the one place where members congregate to share new ideas and progress about Mixed Nuts, as well as interact with the group as a whole. In order to be considered and active member of Mixed Nuts, members must attend all meetings each semester with exception for extenuating circumstances. With Mixed Nuts running solely as a student co-op, this is necessary. Mixed Nuts functions through committees, small groups of Mixed Nuts members, who work to complete various tasks such as bulk ordering, staff management, publicity, and finances (see committees section below for more details). All Mixed Nuts members are strongly encouraged to be part of one or more committee of their own choosing to distribute the labor and get everyone more engaged. Students hoping to get CEL-1 credit from their involvement with Mixed Nuts are required to join and participate in at least one subcommittee. note: due to varying schedules, exceptions can be made if class schedules do not allow one to be present at the meetings. If at possible, however, meetings must be attended. Email mixednutsbulk@gmail.com for a copy of the most up-to-date catalog and more detailed information and instructions, or download below! Look through the catalog and choose the products you’d like to order. Send an email to mixednutsbulk@gmail.com with a list of the products, including Name of Product, Product Code, UNFI Code and Price. Recieve a confirmation reply from the Bulk Manager. Pick up your items in store! The full amount of payment is due at the time you pick up your items. Orders that come in before 7pm on Thursday will come in the following Monday. Grab all the food you want! Inform an employee what you pick so they can prepare an itemized receipt. To be in good standing (and get CEL credit!) every member of Mixed Nuts must be a member of a committee. To contact a committee, email the first person listed. Orders bulk orders for the store and personal orders for people. Also orders products from other local vendors. In charge of planning events. Every student group needs to have one each semester. Organizes physical insides of store, manages cleaning schedules and procedures. Responsible for maintaining the Hampedia page, postering for events, increasing campus and social media presence, spreading customer base, advertising new products, updating our Facebook page, and posting events to the Daily Digest. Connects with communities outside of Mixed Nuts and Hampshire. Also connects with other student groups, and co-ops in town. Works to facilitate community engagement within the co-op (such as orientation), provide a safe-space for any members experiencing any form of difficulty within the group, and ensure respectful and meaningful dialogue. The finances committee is responsible for helping Mixed Nuts keep track of money and plan how to use it, and for keeping the POS system working well. When the store is open, people on the finances committee do cashout (count and remove money from register) and backup the POS system once or twice a week each. The committee keeps in touch with the CLA/business office about our balance and billing. We also meet once every two weeks. In charge of keeping everything organized. Sends out weekly meeting and to-do’s of the week reminders. Mixed Nuts Food Cooperative wasn’t Hampshire’s first food co-op. Hampshire’s first food co-op, “Bob’s Food Co-op,” only lasted two months. Bob McNitt started his co-op with two purposes in mind: to make consumer goods available to the Hampshire community at low cost, and to set up a model for a larger co-op (Fleisher, 1971). He ran the co-op out of his dorm room in Dakin. Unfortunately, because Bob’s “personal beliefs” prevented him from using paper to hang up posters advertising the co-op, nobody knew about it. Bob opened the co-op in October, 1971, and by that December only 21 people had joined, resulting in “economic disaster” (Fleisher, 1971). The following spring, a group of students began making plans for a larger food co-op. However, because over a hundred students were living at UMass (some of the mods had not yet been built), and because of the “propensity of all Hampshire projects to die,” there was a lot of skepticism surrounding the formation of a co-op (Climax, 1972). Nevertheless, in September of 1972, with the help of a $600 start-up fund from Community Council, a food co-op organized out of doughnut three in Greenwich House. In early October, the co-op adopted the name “Mixed Nuts Food Cooperative,” and by early November it had 300 members (Climax, 1972). By 1978, Mixed Nuts had become the major food supplier for more than half the campus. Since its beginning, the coop had been run on a completely pre-order basis. Dairy products and vegetables came once a week, and staples such as grains, nuts, flour, and oil came once a month. However, the rise in membership made the pre-order system difficult–the co-op suffered from tension, long delays, losses due to spoilage, and a poor distribution system in doughnut three which was considered a fire hazard (Mixed Nuts, 1978). Therefore, over the summer of 1978, the co-op financed and built, on a volunteer basis, a walk-in cooler. Physical Plant provided plumbers and electricians to make other improvements, and in the Fall of 1978 Mixed Nuts received additional funds from Community Council towards the purchase of essential items such as weighing scales, cash registers, and shelves. These items enabled Mixed Nuts to operate its store and distribution system more efficiently. For the next nine years, Mixed Nuts remained in doughnut three. During that period, membership ranged from 200-500 people. Depending on the makeup and initiative of its members and managers, the kinds of items sold by co-op varied. At times, the co-op was strictly organic–at other times, it sold a mix of organic and non-organic goods. The co-op often attempted to sell meat, although this only worked when there was a willing manager with a car who could drive to a local farm to pick up fresh chicken, or when there were enough members who wanted meat to justify ordering it through a distributor. Produce and dairy products were distributed every Thursday, and the co-op held regular store hours for people to buy grains and other non-perishables. Over the summer of 1987, the Hampshire administration decided to evict Mixed Nuts from its Greenwich home. The reason for the eviction was a problematic cockroach infestation in Greenwich–however, the co-op had been unaware that it was in danger of eviction–“Last year, members of the co-op had a meeting with Sue Alexander, then dean of students, about the roach situation. No words about eviction were raised in that meeting (Mixed Nuts newsletter, 1987). Frustration, distrust, and misunderstanding between students and administrators plagued the eviction and relocation of Mixed Nuts. The administration promised co-op that it would be completely set up in a new store in Prescott by September 1 (Mixed Nuts letter, 1987). However, as the end of September drew near, co-op still had no permanent location. A letter to Mixed Nuts from Dean of Students Trey Williams, entitled “Let’s Clear the Air,” expressed concern over the level of student resentment over a perceived lack of administrative commitment towards relocating the co-op–“This process is moving along as fast as possible at this point and its pace has nothing whatsoever to do with our level of commitment towards making this move work for everyone involved (Williams, 1987). Trey also reported in his letter that the school had purchased a 10’x35′ insulated storage unit as a new store for co-op, and that the Prescott Tavern would be made avalable to the co-op each Thursday for distribution. However, the “storage unit,” really just a huge metal box, had no electricity, refrigeration, heat, or windows. November came, and the co-op still did not have a working store. At this point, the co-op began to suffer severe financial losses due to food spoilage and extra paid hours for managers. On the brighter side, the Hampshire community rallied around co-op during this crisis. Members volunteered extra time each Thursday to help make distribution run smoothly in the tavern. On November 1, 1987, Mixed Nuts sent an open letter to the community asking for help and support (” … we’re still cold and in the dark, and our food is spoiling … “). On November 10, Mixed Nuts received a reply from Peter Gluckler, assistant to President Adele Simmons, expressing Adele’s concern over the co-op problem (“I am writing for Adele because she is traveling once again. I know that students often view her absences with cynicism…Anyway, she supports the co-op”). Finally, in December, the “container” was equipped with heat, electricity, and a walk-in refrigerator. The co-op was able to set up a permanent space. As The Permanent Press, Hampshire’s newspaper of the time, described it, “Co-op store opens, masses rejoice … our metal box is now a cute little store” (Hochheiser, 1987). After suffering through almost an entire semester of uncertainty about its future, Mixed Nuts was relieved to be finally settled in the metal box, which came to be known as “the Trailer.” However, co-op was far from satisfied with the Trailer. Although Thursday distribution took place in the Tavern, the trailer was put to heavy use by the co-op. As a store, it was far too small. There was no room for expansion–there wasn’t even any running water (Flippo, 1993). Even before the co-op was settled into the Trailer, the manager’s collective wrote a proposal to relocate co-op, permanently, into the Prescott Tavern. A few years later, another proposal was written, this time requesting that full use of the tavern be turned over to Mixed Nuts and Stone Soup (a student collective that sold soup and bread to the community at lunchtime). Both proposals were rejected, primarily because the Marriott Corporation had a contract to operate a grill/restaurant in the Tavern. In 1992, Marriott left the Tavern. With the departure of Marriott, the only groups who consistently used the Tavern were the Prescott House Office and TEAC: the Tavern Entertainment and Activities Committee. Most of the time, however, the Tavern was empty, and closed. In February, 1993, the Mixed Nuts Manager’s Collective distributed a survey to all student mailboxes. The survey asked for student opinions on a potential co-op move into the Tavern. 355 surveys were returned; 322 were in favor of the move, 8 were aginst it, and 5 had mixed feelings (Flippo et al, 1993). Most concerns with and objections to a potential move had to do with the fact that the Tavern would have to become smoke free in order to comply with Amherst health regulations. Other people feared that Mixed Nuts would “take over” the Tavern. However,the general student attitude toward a move seemed positive. Another proposal was written. 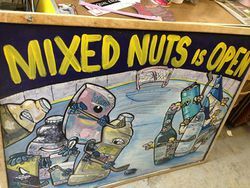 In the new proposal, the managers’ collective expressed its confidence that the project would be successful, based on the success Mixed Nuts had had in the past–“Mixed Nuts is one of the only student organizations that is self-sustaining and probably has been ever since Hampshire opened. Mixed Nuts has a history of very reliable, competent managers. That history is no different today. This plan is being born out of Mixed Nuts and its successful operation” (Flippo et al, 1993). Over the summer of 1993, after seven years of business in a “metal storage container,” the co-op was granted permission to move into the Tavern. A collection of Mixed Nuts’ best moments. If you have pictures you’d like to add, please send them to mixednutscoop@gmail.com! 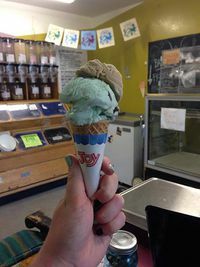 Some delicious Snow’s Ice Cream at Mixed Nuts! 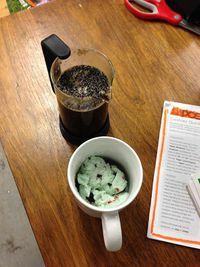 Peppermint Mocha ingredients, come try one today! Some of our products, circa 2011.